A magnesium propeller shaft anode for fresh water cathodic protection designed to help guard against corrosion of underwater gear such as, propellers, shafts and rudders. It is important to remember NOT to paint anodes when antifouling. Doing so will prevent the anode from working and may cause expensive problems. This MG Duff magnesium shaft anode for fresh water conditions is designed to help guard against corrosion of underwater gear such as, propellers, shafts and rudders which are vital to the vessel and are expensive items to replace; the failure of a propeller or rudder could have disastrous consequences. The shaft anodes split in half and clamp around the propeller shaft with two fixing bolts. If corrosion is allowed to persist the effects can vary from pitting of propellers and shafts to the decomposition of the alloy. The failure of something as small and inexpensive as a split pin can result in the loss of the propeller. Underwater corrosion control is an essential maintenance task and something to consider. It is relatively easy to replace existing anodes and install new cathodic protection systems if required. Cathodic protection is an electrochemical process which halts the natural reaction (corrosion) of metals in a particular environment by superimposing an electrochemical cell more powerful than the corrosion cell. 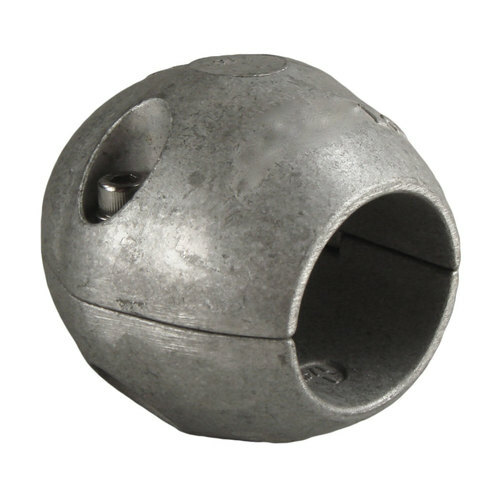 Sacrificial Anodes are fitted or bonded to the metal to be protected which in turn as it has a greater electrical potential than the anode material becomes cathodic and causes the anode to waste instead of itself. In a correctly installed cathodic protection system the only corrosion occurs to the sacrificial anode which is replaceable. 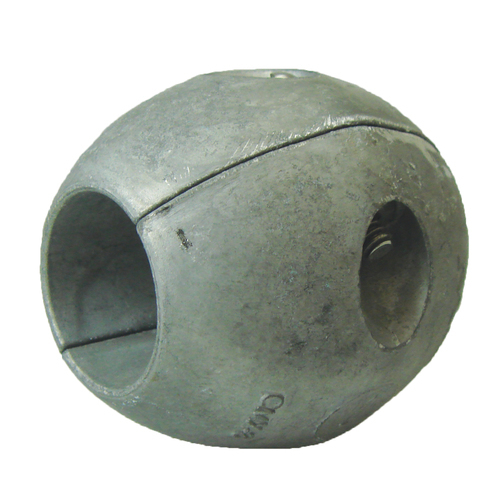 The number and size of anodes is determined by the type of material and the surface area being protected. Which anode should I choose? Brackish water - Fit Aluminium anodesÂ (Brackish water is a mixture of fresh water and salt water, commonly associated with estuary waters). Not all anodes are suitable for every environment, for example the surface of a zinc or aluminium anodes will if left in fresh water for some time become covered with an off white crust of oxide which effectively seals the anode and stops it working even when returned to salt water. Zinc anodes suffer a similar problem even in brackish conditions whereas aluminium will continue to operate effectively in river estuaries and other areas of brackish water indefinitely. The consequences of this passivation of the anode are that the next most anodic item within the anode bonding system will start to sacrifice itself which could of course be very serious. Owners must be aware of the effects that this may have on their boats and fit the correct cathodic protection system to avoid corrosion. Please note: Magnesium anodes are not suitable for wooden hull vessels as they can damage the timber. Please contact us for further information.